This provocative and educational video investigates how and why millions worldwide become "medicine cabinet junkies" and "accidental addicts" to doctor prescribed tranquilizers, sleeping pills and anti depressants. Available in North America VHS Version and International PAL Version. TWO ESSENTIAL TITLES YOU MUST HAVE! THE HIDDEN WORLDWIDE HEALTH EPIDEMIC!! Addiction to Prescription Drugs is 10 times the problem of illegal drugs, is far more gripping and debilitating than heroin or cocaine addiction, costs society and individuals billions of dollars and affects the quality of life of millions worldwide who become accidental addicts. Are you aware that anti-depressants (the follow up to Valium 25 years later) also have potentially serious side effects including drug-induced mania leading to suicide, suicidal ideation, violence, criminal acts, disinhibition, drug induced severe anxiety, agitation and depression, drug-induced obsessions and compulsions, drug-induced akathisia, tolerance, addiction and withdrawal etc.? 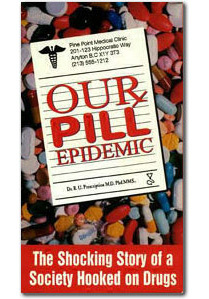 If you are concerned about prescription drug addiction and its effects you need to order the book Addiction by Prescription and the video Our Pill Epidemic. The high socio-economic and health costs with the continued indiscriminate prescribing and uninformed usage of these drugs includes health and safety in the work place, career devastation, family dysfunction, productivity losses, car accidents, falls, floppy baby syndrome (similar to fetal alcohol syndrome), lost years of people's lives, lost lives, costs to the legal and justice system, workers' compensation board claims, life and disability insurance claims, social welfare costs, emergency admissions, physicians' fees, pharmacists' fees, drug costs, detox facilities and increased overall costs for healthcare and other public/private sector services. Prescription drugs are "big business" for the multi-billion-dollar international drug companies with worldwide sales estimated at $300 billion. Central Nervous System drugs including BENZODIAZEPINES (tranquillizers and sleeping pills) and ANTI-DEPRESSANTS have reached an estimated $75 billion. Drug companies spend more on marketing and promoting their drugs than on research and development  ($15 - $20,000 per doctor) and an estimated $8.3 billion in the United States in 1998. Benzodiazepines  including such tranquillizers and sleeping pills as Ativan, Dalmane, Librium, Restoril, Rivotril, Serax, Xanax and Valium  are the best selling drugs in the history of medicine, with annual worldwide sales exceeding $21 billion. They are prescribed to 30% of the adult population in the world. With such a lucrative market at stake, high-powered drug company promotional campaigns have convinced millions that tranquillizers and sleeping pills are needed to cope with life's everyday challenges. Millions of prescriptions  close to two thirds for women and almost 75 percent for refills  are written each day worldwide beyond short term guidelines of 2  4 weeks established over 20 years ago. Doctors continue to prescribe despite known and often serious physical, cognitive and emotional side-effects. Dependency occurs in an estimated 60% of people prescribed these drugs beyond a few weeks, and withdrawal can be lengthy and frightening. The bottom line? Millions of people throughout the world are becoming addicted by prescription or become "Accidental Addicts" from trusting their doctors "to do no harm." A booming market also exists for anti-depressants such as Prozac, Paxil, Zoloft, Luvox, Wellbutrin and Effexor with worldwide sales in the billions of dollars. Anti-depressants (often referred to as the follow up to Valium 25 years later) in the United States in 2000 reached $10.4 billion in retail sales up 21% over 1999 and representing a startling five-fold increase since 1993. Anti-depressants including Prozac, Paxil, Zoloft, Luvox and Celexa can have significant side effects including drug induced mania leading to suicide, suicidal ideation, violence, criminal acts, disinhibition or out of control behaviour; drug induced severe anxiety, agitation and depressions; drug induced obsessions and compulsions; drug induced akathisia (an internal sensation of agitation or discomfort that drives a person to move about and also to lose impulse control); tolerance and addiction leading to a recognized withdrawal syndrome which can include bouts of overwhelming depression, insomnia, fatigue and life-threatening physical effects, psychosis and violent out bursts. 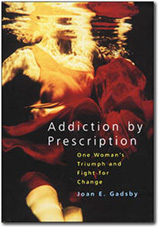 Since writing her internationally endorsed book"Addiction By Prescription" published in 2000,Joan has continued with great persistence and dedication to create awareness and bring about much overdue systemic change worldwide re addictive prescription drugs - benzodiazepines and antidepressants. Joan views antidepressants as the follow up to valium 20 years later. Based on her many years of comprehensive research into addictive prescription drugs and through her own experience, Joan received an Honorary PhD for her work in this field in which she has become an internationally recognized authority,educator,advocate and presenter at many international conferences. She also continues to do media interviews throughout North America and in was in Washington,D.C filming a television program for the Retirement Living Network several years ago. Joan also provides medical and legal consulting services to various clients including lawyers, mostly in North America as her time permits. A feature film/movie project based on her book is in the development stage and remains a passion and priority for Joan. In 2003 after 12 years of costly and frustrating litigation against her former doctor and former lawyer( who was found to be egregiously negligent in the first trial), Joan made the difficult decision not to continue with a further Appeal and to move on with her life leaving behind over $2 million in economic losses and damages from her former prescription drug addiction. Joan has been off all prescription drugs for over 18 years now,has rebuilt her health,her family and her life and firmly believes God kept her alive from her unintentional overdose in February 1990 when she almost died ,to continue to carry on her important message of the horrific effects of addictive prescription drugs - an accidental and doctor induced addiction.Denial,ignorance and apathy unfortunately continue today within the medical profession while drug companies continue to be motivated primarily by money and bottom line profits for these addictive drugs. The tragic deaths of Joan's 2 beloved children,Derek in December 25,1966 with a brain tumour and Deb , May 1,1999 of breast cancer continue to have profound effects on Joan's life.Both are in her heart ,thoughts and prayers daily. The birth of her 2 grandchildren,Veronica who is 6 and August who is 3 to her daughter Carrie and her husband David,a former New Yorker,and who live minutes away from Joan's home in North Vancouver,Canada have brought new love,joy and meaning to her life. This website is committed to responsible prescribing and informed use of tranquillizers, sleeping pills and anti-depressants. It does not provide medical advice. Be Informed and Knowledgeable about Addictive Prescription Drugs!